When is the Best Time to Buy a Snow Blower? On the surface, snowblowers seem like simple devices. Their purpose is to move as much snow as possible. But they’re actually a bit more like automobiles. Packed with features and add-ons that can dramatically affect your experience. It’s important to be understand what features are available. We’ve compiled a list of both essential features and their purpose, along with non-essential ones that may be of interest. After deciding which type of snowblower is right for you and reviewing available features, you should be on your path to making an educated purchase. If you don’t feel like pushing a 250-pound snow blower around, you’ll want a self-propelled one. Especially if your driveway has a slope to it. While most snow blowers offer at least one speed, you’ll want to find one that has multiple. Multiple speeds allow you to tackle the snow based on your conditions. For light snowfalls of the fluffy variety, you can move through at a fast pace. But with heavier wet snow, you’ll want to slow it down to give your blower time to discharge it all. This also prevents the chute from clogging. Not only can these be found in forward, but some models offer variable speed in reverse too. Gas-powered machines are started using a pull-cord (recoil start). But those can sometimes have issues, especially in extreme cold temperatures. That’s why a popular feature has been to start your snowblower electrically. Simply plug your machine into an outlet and hit the electric start button to get things going. There are a number of benefits to an electric push button start. It will increase the life of your pull-cord as you won’t need to use it as much. Electronic start works better in sub-zero temperatures. And perhaps most importantly, you won’t need to deal with the physical strain on your shoulder. Being able to control where the snow ends up is one of the most important elements of snow removal. Traditional snowblowers required walking to the front and manually moving the chute in the desired direction. But newer models have implemented joystick chute controls (or mounted cranks). Now you can change the vertical and horizontal direction of the chute with a joystick. It’s important to note that these differ from brand to brand. You’ll want to make sure the controls are accessible while controlling your snowblower with the other hand. You’ll also want to test how they handle with winter gloves on. Convenient chute controls can speed up the process and ensure the snow is going where you want it. In two-stage and three-stage snowblowers, there is a lever that controls the wheels and another that handles the auger. The problem with this is you have no free hand to adjust the chute. Some models now feature single-handed operation where you can control the lever for the auger and wheels using one hand. This is a helpful feature that will increase overall efficiency. When it comes to a 28-inch 300-pound snowblower, you’ll want some assistance when it comes to turning. Heck, this is a great for even smaller machines. This feature works by slowing down the inner wheel to allow a sharper turn radius. Sometimes they are controlled with a lever under the handlebar and some will work automatically. This seems like a luxury you don’t need but it really is great on cold days. Especially if you plan on being outside for a long period of time. Keeping your hands warm makes it easier to control the levers and joysticks. It’s more important than you might think. This is a newer feature that is being rolled out throughout the industry. If you’re working on gravel or other unpaved surfaces, these tires will prevent flats. Something that can be frustrating during a big snow storm. Troy-Bilt started adding them back in 2017 and others like Cub Cadet and Ariens have followed. There is even an option to upgrade from your existing pneumatic tires. This extra feature is important for those who do their snow removal when it’s dark out. Beyond illuminating the path in front, it has an added safety benefit (even during the day). This will give notice to oncoming motorists when you’re working near the end of the driveway. These are found in most two-stage snow blowers. Because the auger on those machines doesn’t touch the ground, they are needed to help guide the blower over uneven surfaces. There are a number of 3rd party replacements that provide an upgrade over the stock skid shoes. These are important for providing a smooth glide on gravel surfaces or bumpy sidewalks. While they come standard on most models, aftermarket skid shoes can be a major improvement. If you live in a windy climate, you’ve experienced large snow drifts. These can be a struggle for standard snowblowers to handle. Drift cutters attach to the outside and help direct the snow into the auger. This prevents the snow from piling up on top of the machine and requiring multiple passes. They are inexpensive and can be easily added to most models of snowblowers. This is used as a space saving feature. If you don’t have a lot of room to spare, this can help. Typically found in single-stage models. Instead of wheels, these snowblowers use a track system. Similar to what you see on a tank. This allows for exceptional traction on the iciest of surfaces. These models are best for those working on steep inclines. 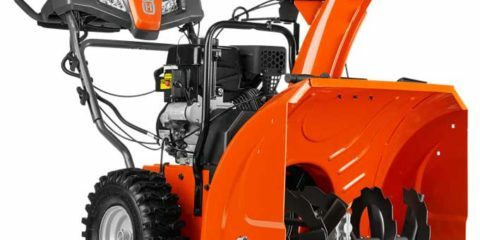 SnowBlowers.net is a participant in the Amazon Services LLC Associates Program, an affiliate advertising program designed to provide a means for us to earn fees by linking to Amazon.com and affiliated sites.